I tried something new on this card. I added a sprinkling of embossing powder to the ink I used (direct to paper) to accent the dry embossing. Some of it stuck to the bit of ink that got on the debossed areas so I brushed it off with a soft brush. The circles that look really dark are just mirrored gold sequins. I promise they aren’t dark brown! This card is for Cardabilities #80 (unfortunately, I am several week’s behind) and Joan’s Gardens. 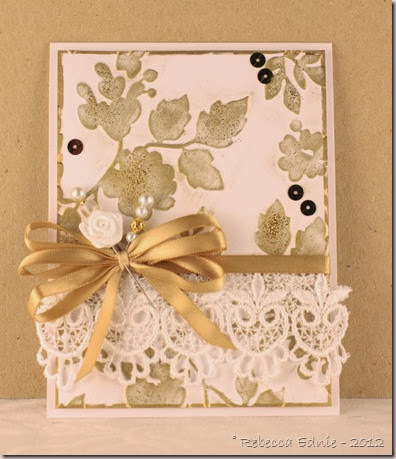 Accessories: Anna Griffin embossing folder-Sizzix, gold ribbon, lace, large gold bead, white bead-stash, corsage pins, pearls-Michaels, small gold bead-Fore Mountain Beads, rose-Jesse James buttons, sequins-Fabricland, gold EP-SU!